Have you observed what happens when rain falls on parched earth? When the skies open up to a free fall of unbiased, all encompassing, loving, fresh rain? 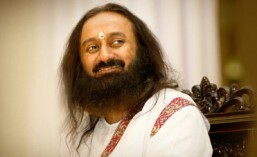 That is what Sri Sri Ravi Shankar ji’s visit was to Assam. Sri Sri visited the relief camps at Kajalgaon High School and interacted with a large gathering of Bodos—all victims of the riots. He told them to face the tragedy with courage and to prepare themselves to reclaim their life. He urged them to go back to their villages with the feeling of belongingness. He enquired about the safety and the comfort of the Muslim people who were displaced by the riots too, and were in the Basugaon Camp. He assured them to have faith in God, and that things would come back to normalcy. In a meeting with the representatives of several organizations such as the All Bodo Student Union, Bodo People’s Front and the academicians from Kokrajhar University, Sri Sri discussed ways and means to end the conflict and to identify and work on long term solution to the problems of Bodo-land. He also met the representatives of the All Bodo Minority Students Union at Bongaigaon, and listened to their concerns and point of view. He urged them to work for a harmonious and a peaceful coexistence with the communities in the Bodo-land. In a press conference Sri Sri urged that the government should settle the matter in Assam politically without playing dirty politics. He said that the issue of illegal immigrants should be the government’s responsibility and not the people’s.